In Zimbabwe there is now deep concern that the use of cyanide represents a new and particularly damaging technique in the already soaring poaching trade. The southern African country's Parks rangers are on high alert after they found four areas in the Hwange National Park contaminated with cyanide, The Chronicle reports. Conservationists fear such incidents are escalating, saying relatively easy access to agricultural chemicals and the surging illegal market for animal parts are increasing pressure on a number of already beleaguered species. With elephant numbers across Africa declining rapidly under the onslaught of ivory poachers, Hwange National Park was mainly known for having an elephant population which kept growing. This was until the first known case of elephant poisoning in Zimbabwe - a single massacre of over 100 elephants at Hwange in 2013. Since then it has become a common means of poaching not only in Hwange but throughout the country's protected areas, including the Zambezi valley and Gonarezhou national park. In October 2017 alone, 13 elephants were killed after poachers used cyanide to poison a salt lick near Victoria Falls according to The Chronicle. 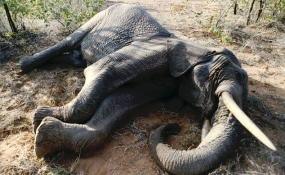 Last year the authorities estimated that 53 elephants were killed with cyanide poisoning. Thousands of rangers around the continent face the threat of death daily in the line of duty, from rogue soldiers abetting poaching, rebels in unstable countries, drug and smugglers' cartels and even from the wild animals they are meant to protect. Esmond Bradley Martin, 75, was found with several stab wounds to the neck. The American who lived in Kenya for decades was a key figure in the global crackdown on illegal ivory supply chains. No arrests have yet been made. Anti-poaching campaigner and South Africa national, Wayne Lotter, who lived and worked in Tanzania for many years, died on the spot when three gun-toting men ambushed his car and shot him at close range. The ban on all sales of ivory products in China this year was hailed by conservationists as an important step in the fight to protect endangered species such as African elephants, and as China had been one of the world's biggest markets for African ivory. The move has had a big impact already although it doesn't apply to Hong Kong where the trade is still legal for at least another five years.